The Chan Centre for the Performing Arts at UBC presents the boundless sounds of the Cristina Pato Quartet on April 11th in the Chan Shun Concert Hall. 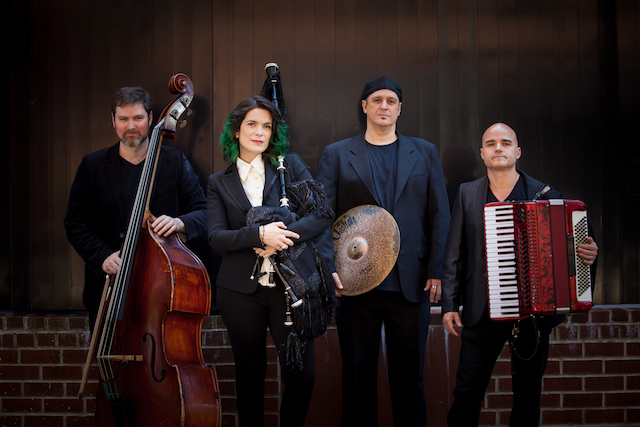 Cristina Pato is a musical force, skilfully playing at the edges of jazz, classical, Latin, and world music with a tightly knit, synergistic band featuring Julien Labro on accordion, Edward Perez on double bass, and Mauricio Zottarelli on percussion. Cristina Pato is a master of the gaita (Galician bagpipes), and her sophisticated sound skirts the boundaries of jazz, classical, folk, and world music. Pato’s high-energy quartet—which showcases the gaita alongside accordion (Julien Labro), double bass (Edward Perez), and percussion (Mauricio Zottarelli)—recently released Latina, an album which expertly hones in on the rich complexities of Latin music. Pato has produced and released six solo gaita recordings and two albums as a pianist, in addition to collaborating on more than 40 recordings as a guest artist. Her work with Yo-Yo Ma on Songs of Joy and Peace (2008) helped earn a Grammy Award for Best Classical Crossover Album. She tours regularly throughout the US and Europe, and has shared the stage with artists such as jazz pianist Arturo O’Farrill, Cuban saxophonist Paquito D’Rivera, and the musicians of the Chicago Symphony and the New York Philharmonic. Follow The Chan Centre on Twitter, Facebook and Instagram for more information about upcoming shows. I will draw one contest winner at random from all entries at 12:00pm on Friday, March 29, 2019. UPDATE: The winner is Anna! I would love to hear Falician bagpipes! Yes, would love to go! Sounds amazing, I love jazz, classical & live music, what a treat! Coming to Vancouver from Nunavut. Would love to see this show! We’re big fans of bagpipes up here! saw Yo Yo Ma’s the music of strangers. This is another great example of blending different instruments. How cool. Would be the first time to attend Chan Centre, and first time to hear Christina Pato Quartet! Would love to attend this concert svp ! Looks like it would be a great concert – interesting combo of instruments! What an interesting combo! I’ve never heard or heard of a gaita before.